Cambodian Rice Body Faces Own Shortcomings - Integration Through Media ....! 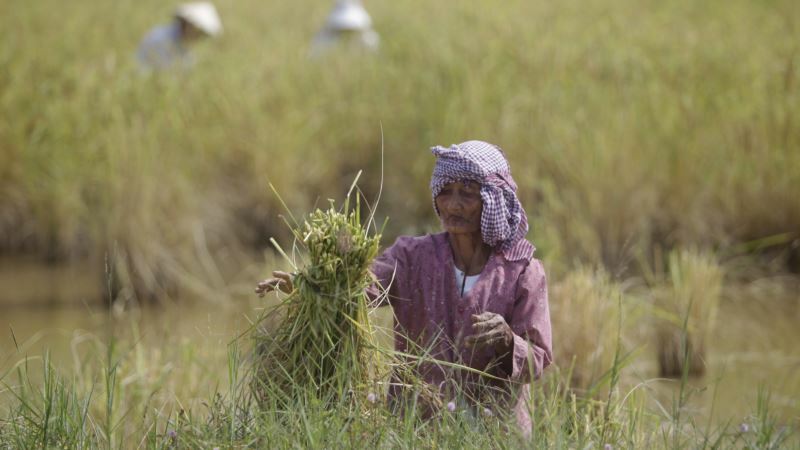 (VOA): In a startlingly frank report last month, The Cambodian Rice Federation (CRF) warned the country’s entire export market could be destroyed by the scourge of rice smuggling. The report, which detailed a laundry list of problems within the CRF itself and the sector as a whole, provides a window into the deep dysfunction and fragility of an industry that occupies a fundamentally central place in Cambodia’s society and economy. The CRF was founded in 2014 to try and turbocharge a Cambodian rice industry that lagged far behind rivals Thailand and Vietnam in output. While exports rose in 2017 by 17.3 percent on the previous year to about 700,000 tons following a years long upward trend they remain far shy of Vietnam, which exported nearly 6 million tons and Thailand, which exported more than 11 million tons in the same period. The reasons for this chronic inefficiency are myriad and complex, as the CRF report noted. It raised concerns over fake branding, price manipulation, disciplinary issues and conflicts of interest in the CRF board, a lack of credible data, favoritism, mistrust and the impact of “the prevailing pattern of land grabbing,” on farmers. It also raised the topic of Vietnamese smuggling which, until recently, had been such a taboo subject that when a public spat erupted in 2013 over the scale of the problem, Cambodian officials came out in force to flatly deny the issue existed. In a departure from that tradition, the CRF pointedly raised the threat Vietnamese smuggling posed to WTO and ASEAN trade compliance rules and regulations in its report. “Smuggling of milled rice from Vietnam hinders efforts to comply with the rules of origin, as there are complaints about re-exporting rice into a third country. This could cost Cambodia the entire export market,” the authors wrote. Rules of origin regulations vary among trading partners but the biggest concern by far for Cambodia would be if smuggling invalidated their preferential access to the EU market. In 2017, 43.54 percent of Cambodian rice exports went to the EU according to government figures. “When benefiting from the free access to the EU market under 'Everything But Arms' scheme, Cambodia has to ensure that the rice exported to the EU is fully homegrown,” the source said. In 2014 the CRF established a Cambodia Code of Conduct which barred firms from exporting rebranded cheap rice from neighboring countries and two years later claimed to be tightening border controls on illegal imports. The effectiveness of the implementation of the code though remains questionable. CRF deputy president Seu Rany said the CRF did not have any hard statistics on the amount of Vietnamese rice being smuggled into the country but accepted it remained a serious problem. “The criminals who smuggle the rice do not tell us through which gateway they do it through so it’s all secret and shady,” he said. The rice federation board is dominated by wealthy and political connected tycoons at the top of the industry and is chaired by Sok Puthyvuth, the son of late Deputy Prime Minister Sok An and owner of one of the biggest rice export companies – SOMA group. “Dominating members are accused of using CRF for their own benefit, discouraging the willingness of other members to pay membership fees or make other contribution or engagements,” was one of the 2017-2021 Strategic Plan’s findings. Chhong Sophal, coordinating officer of an independent national network of farmers associations called Farmer and Nature Net, said one of the most important things the rice board would find rice farmers lacked was simply coordination. Rany, the board's deputy chairman, said change would take time.